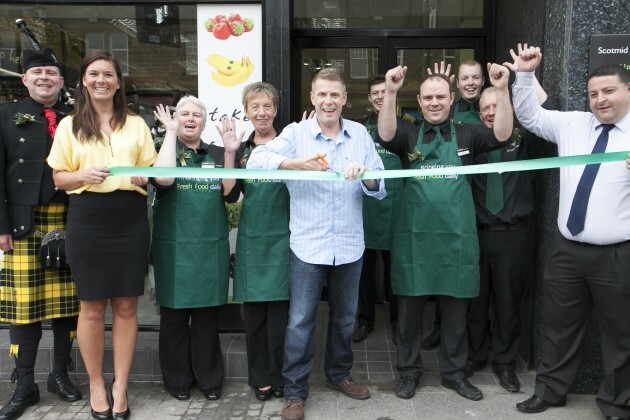 Boogie officially opens the new-look St John's Road Scotmid. "It’s a better shopping experience now and our new in-store bakery is fantastic." Boogie from 97.3 Forth One officially opened the new-look Scotmid store on St John’s Road in Corstorphine today (Friday 23 August 2013). The radio star was on hand to cut the ribbon and welcome the first customers into the store. The Scotmid store has been completely revamped with a brand new look and new services for customers, including a new bakery from the Scottish Baker of the Year 2013, Stephen’s the Bakers. The store also has speciality artisan breads available from The Breadwinner Bakery, a larger range of fresh fruit and vegetables, a bigger chilled section and an extended range of wine and craft beer. The store’s opening hours have been extended to 6am to 11pm, seven days a week. The new-look Scotmid store is at 145 St John’s Road, Edinburgh, EH12 7SD, and is open from 6am to 11pm seven days a week.